Many people, most in fact, enjoy music. It calms us, energises us and helps us to find focus when we are stressed and out of sorts. Few things have the ability to make us feel nostalgic like hearing a favourite old song; suddenly, we are swept back in time. So while there is no question as to the pleasure factor of music, what about studies that seem to indicate that music actually aids cognitive development in children? 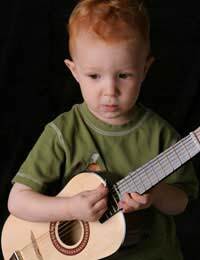 A recent Canadian study compared a group of children aged four to six who took music lessons against children of the same age who did not. The findings clearly indicated that the student who took the lessons scored higher on general intelligence tests, literacy, math ability, and also performed better on simple memory tests. A total of 12 children were involved in the study, six of whom were enrolled in Suzuki music lessons, a Japanese teaching method wherein children are instructed to listen to and imitate music before they learn to read it. Brain activity was measured on all 12 children, with every child scoring higher as the year-long study progressed, but with the Suzuki enrolled students showed greater improvement than their peers in the areas of attention and sound discrimination. Dr. Takako Fujioka, from the Baycrest's Rotman Research Institute, who contributed significantly to the study said, "It is clear that music is good for children's cognitive development and that music should be part of the pre-school and primary school curriculum." While the Canadian research study included only a small sampling of children, the findings were in agreement with numerous previous studies. Educational and developmental specialists have speculated for generations that musical instruction benefits children far beyond the musical realm. Reading: A well controlled study by Hurwitz, Wolff, Bortnick and Kokas in 1975 started with a group of children who showed similar scores on intelligence tests and then placed them into the same classroom setting with the same teacher, keeping all aspects of their educational process identical, with the exception of adding musical instruction to part of the group. Without fail, the children who received music lessons scored markedly higher on reading tests than their peers. Now over 30 years old, the findings from that study are still considered accurate and relevant. Twenty days into the study, all three of the non-control groups scored higher than the control, with the music/dance group scoring best on knowing their body parts and on the creativity tests. Spatial Ability: In a paper presented to the American Psychological Society in 1994, researchers studied two groups of preschool children, half of whom received daily singing and keyboard lessons. The children were then tested using standard IQ tests, one of which measured their abilities to complete spatial tasks (the ability to mentally rotate objects). After 4 months, the musically instructed children scored ahead of their peers, with an even greater improvement documented after eight months. Even without the backing of research studies, many parents and educators will attest that children not only take pleasure from musical instruction, but that they seem to flourish when music is a regular part of their lives. Lessons taught in musical form stick with us for years and music lessons help children by calling on their growing minds to think and learn in new ways. It seems logical that exposure to music would facilitate reading capabilities, since the rhythm of music and patterns of sentence structure share some common qualities. While music is certainly a form of artistic expression, it is also an example of mathematical balances. So, does music benefit the cognitive development of children? Experts and laypeople alike would likely say that is offers definite benefits.